What is the easiest way to setup and check multiple emails? I get this question often – twice just yesterday. There are 2 main ways to handle email: On YOUR computer or in the cloud. Until about 5 years ago I used Outlook Express (obsolete now) and pulled all my email onto my computer, created folders, and filed/stored all my email. Although this is a common practice ~ there is 1 flaw. It opens you up to getting a virus on your computer via email. That is what happened to me and I ended up loosing a bunch of data and buying a new computer ~ both terrible results! My preferred way to handle email is via the cloud ~ store all your email on someone else’s server and only download what you actually need to have on your personal computer. Since I started doing email this way my incidence of virus attacks dropped significantly. There are many options for cloud based email, but I choose Gmail for many reasons. It has 10GB of storage offered for free. If more is needed it is available to purchase. I have multiple email boxes (from different domain) pulling into my Gmail box. None of my customers know I use Gmail ~ it is behind the scenes. My email responses come from the email the sender used ~ eliminates confusion. On the screen that comes up there are tab links going across the top. Choose the 4th tab that reads “Accounts and Import“. One the page that come up there are sections going down the page. The 4th section down is “Check mail from other accounts (using POP3). In that section click “Add a POP3 mail account you own. Follow the form that pops up. You will need to know your email address you are wanting to import, the password, username, POP server, port number. I am including screen shots of the steps that follow. I always make sure the box next to “Leave a copy of retrieved message on the server” is UNCHECKED. I do not want my server to get full (since I never go there) and start to reject emails. This ensures the server is always emptied automatically. This is also a great way to purchase smaller boxes since your storage is on Gmail not your server. Server information is unique to your email box. 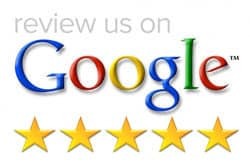 Get that information from your Hosting provider or Domain provider depending on where your email box is set up. The next window asks if you want to be able to SEND mail is your new address. The answer is YES. Fill in your desired Name (How you want it to look to others) and leave the “Treat as an alias” checked. Leave the next cressn as it is. 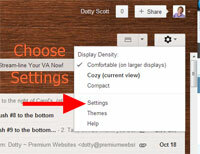 Send through Gmail is the option you want. Gmail will send a verification email to the address you are adding. This verifies you own the email address. Click Send Verification then go to that email box and either get the verification number to past into the box or just click the link in the email. Back in the Email Settings then Accounts and Import you will see the new account has been added in both section 3 and 4. Notice at the bottom of section 3 there is an option to “Reply from the same address the message was sent to“. I leave that checked so that people do not get confused if you reply from a different address than what they sent an email to. 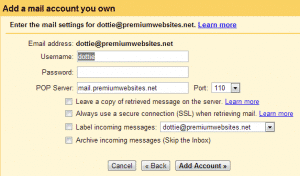 This makes it easy to pull emails into Gmail from many different domains and accounts. PS: Those of you that know me might have realized I just set up an email for dottie@premiumwebsites.net. I spell my name dotty. The reason I have an email account with the wrong spelling is because I get people sending me email to that spelling and they wonder why I do not get the email. 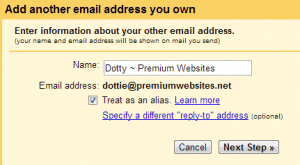 Email Tip: Set up an email address for all common spellings of your name.